Dr. Ajay Kumar Sinha, MBBS, MD(Anaesthesiology), PDCC(Cardiac Anaesthesiology, is a Senior Consultant in the Department of Cardiology at Max Healthcare, Mohali. Prior to joining Max, he had career stints as a Consultant & Cardiac Anaesthetist at Fortis Hospital, Mohali; Consultant Cardiac Anaesthetist at Magadh Hospital, Patna; Registrar Anaesthesiology at Kurji Holy Family Hospital, Patna. 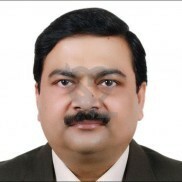 Dr. Sinha completed his MBBS from Ranchi University, followed by MD(Anaesthesiology) from LNM University, Dharbhanga. Thereafter, he went on to achieve Post Doctoral Certificate Course(PDCC) in Cardiac Anaesthesia from the SGPGIMS, Lucknow. To his credits, he has numerous clinical research papers to his name in various peer reviewed journals. Besides he holds membership of various professional associations of his domain and actively participates in orations & conferences held nationally.